Peppermint Bark is a very popular Christmas and wintertime chocolate treat. It typically consists of layers of dark and white chocolate studded with bits of peppermint. Some have more chocolate than others, and some have more mint, but they all get the same chocolate and mint combination across. Peppermint mochas are already a popular winter drink in coffee shops and, after getting a huge box of peppermint bark as a pre-holiday gift, I decided to use it as a base for my own peppermint mochas. 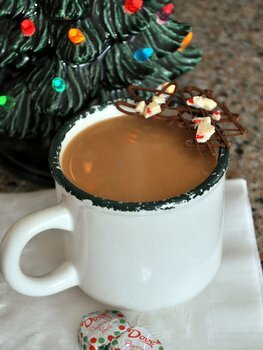 The recipe is easy: melt peppermint bark into hot coffee, top with milk and serve. You can garnish it with a peppermint stick, if you like, or just munch on any unused peppermint bark while your sip your holiday drink. The amount of peppermint bark you will need for this recipe will vary, depending on the type of bark you have and how minty it is. Start with the 2-oz I recommend and go up from there as needed. If you need to add more, just go ahead and do it. You can always reheat your drink a little bit in the microwave to ensure that it is hot enough to melt all the chocolate. Place chopped peppermint bark at the bottom of a large coffee mug. Top with hot coffee. Allow mixture to sit for 1-2 minutes before stirring, to soften the chocolate. Use a spoon or a small whisk to blend the melted chocolate and the coffee. When smooth, add milk and stir to combined. Garnish with a piece of peppermint bark or a peppermint stick, if desired.